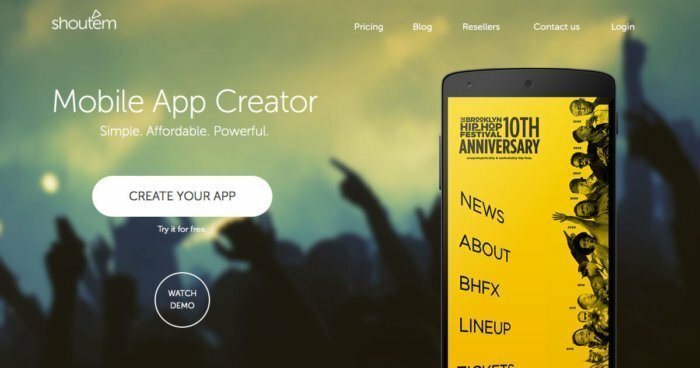 Are you interested in creating and selling apps? It could be a lucrative career. According to a recent report, 67% of SMBs plan to have their own mobile app by the end of the year. Could you give them that solution? Well, the good news is that you don’t need a team of iOS and Android developers to create an application these days. If your client's needs are simple enough, you could absolutely use an app maker and claim credit for their platform and development tools. In fact, they actively encourage it through their reseller, or white label app programs. Do I need to hide the app maker brand? So what is a white label app? 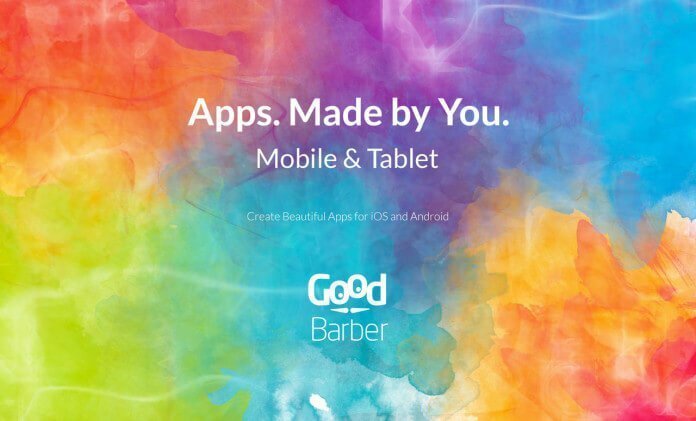 Let’s say you use GoodBarber to create an app. You can log into their platform, play around, add features and publish it online. When you do, you will be using the GoodBarber website and backend. Their logo and branding is everywhere. But are building a GoodBarber app for someone else? You could give them login details to see how their app is coming along. You could also give them access to add content and publish it themselves. But as a white label app, it will look like you created the backend yourself! In short, you are paying for the right to replace any mention of GoodBarber with your own name or company name, while enjoying all of their features. Of course, any mention of their pricing will also be hidden from view. Do I need to hide the branding? Actually you don't. In fact, some resellers prefer to keep the name of the app maker to leverage the brand as part of their pitch to clients. Ok I want to start – now what? Price structure: the app makers world is still fairly new, which means a lot of experimentation with pricing structures. While they are generally paid monthly, you can also pay a lump sum for a certain amount of apps. Some give you a discounted price per app volume. You have to make sure the pricing structure make sense for the kind of reseller business you will run, and that it allows you to scale your business over the years. Features: are you going to focus on creating event apps? Or maybe apps for local shops? Different app makers offer different features, so don’t get locked into a contract with one that hasn’t got the features you need. Custom features: because app makers focus on a one-size-fits-all model, you might need to implement extra features for your clients. Most app makers let you integrate those, so you could invest in a developer for the odd coding job. Developer accounts: Once the apps are built, you will need to submit them to an app store. This is done with a developer account and it costs $99 / year for the AppStore and $25 forever for the Play Store. 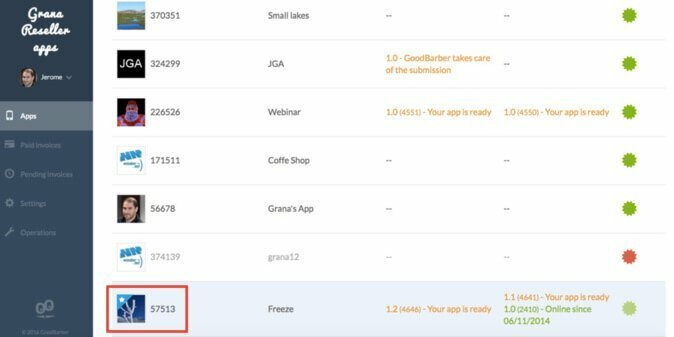 Some app makers let your clients submit through their own developer accounts, but make sure they understand the price and process. Reseller dashboard: When you are building or managing several apps at once, things can quickly get confusing. All app makers should give you access to a good dashboard where you can see the status of your apps and any recent updates (made by you or your clients). The Goodbarber reseller dashboard. You can see the status of each app you build and publish there. Team Management: In case you are working as a team. 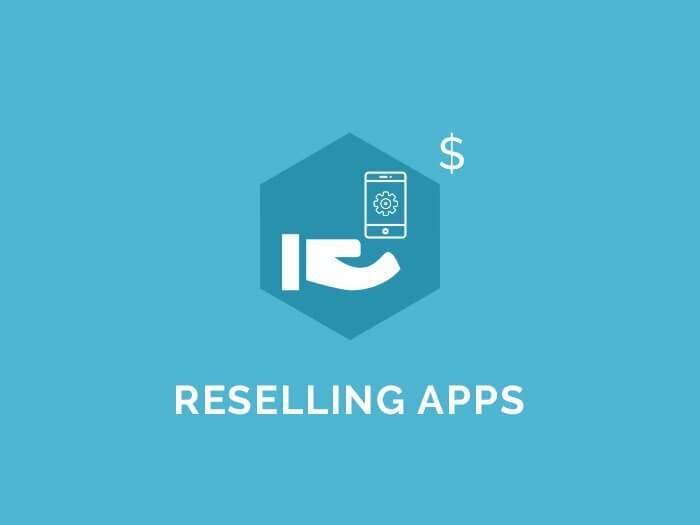 Your app maker reseller program should let multiple users access the reseller dashboard. Client CMS: Letting your clients see the app backend is one thing. Giving them the tools to create their own content in the future is another. This is done through a client CMS (content management system) and it could be hugely beneficial if you want them to add regular posts or offers without having to oversee everything. Priority support / training: By building multiple apps at once, you will become one of the app makers’ power users. You will also be responsible for any technical problems if something happens to your clients’ apps. So make sure the support is fast, reliable and efficient. Marketing tools and resources: As a reseller, your main priority will probably be to find new clients. Some app makers will help you in your search by offering tools and resources to bring in extra business. Here is a post from AppInstitute, for instance. The table below shows you a quick overview of 5 different reseller programs. Scroll down or click on their name for more information about each of them. Best for Offering unlimited apps makes them hard to beat for scaling your reseller business. Unlimited apps and complete control over the source code is a big plus. You can also built a payment gateway for clients. BiznessApps give you all the tools and resources you need to actually sell your apps. The sliding scale is useful if you’re just launching your reseller business. They also have a unique Business Directory feature. 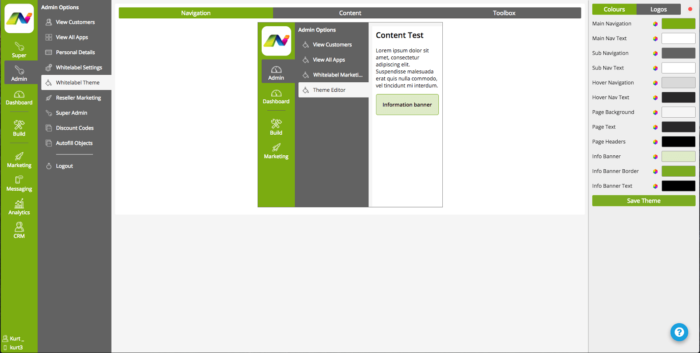 AppYourself's CMS tools seem very attractive if your users need to update a lot of their app content themselves. Price: $240 / month or $2400 a year for an unlimited amount of apps. There is a plan at $150 / month for unlimited Progressive Web Apps. You need an app developer account for each iOS app you submit ($99 / year). There is an extra review fee for submitting to the app store. Add-ons: some features need to be purchased on a per app basis (between $40 / $80 per year), but you can also buy unlimited add-ons, starting at $80 / month. Geofences: each app comes with 6 free geofences, and you can buy 25 more for $6 / month. iBeacons: you get 6 free beacons per app and can buy 25 more for $12 / month. Main features: A good range of features, from loyalty options to unlimited push notifications. You can read a full review of their offer here. Reseller tools: good reseller dashboard. Cloning tool to easily duplicate an application. 6 weeks on boarding reseller training that includes a 45 min 1 on 1 call per week to help you get started. Ability to integrate custom code. Online resources (available for everyone). Unique approach: GoodBarber was one of the first platforms to focus on Progressive Web Apps (PWA). It might be a tough sell for clients, but they could get a simplified website that acts as an app. Their apps also tend to put content at the front, making them ideal for blogs, news publications and magazines. 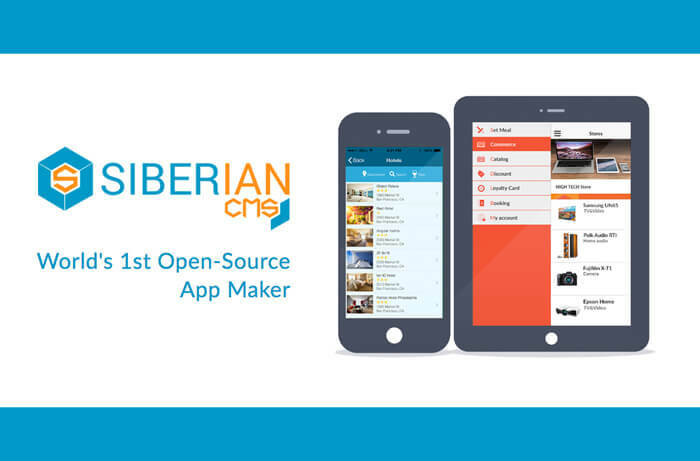 Price: Siberian's Multi App Edition (MAE) for resellers comes in two flavours: one time fee of 399€ if you host the platform yourself, or 79€ per month if they host it for you. These all give you unlimited apps. There is also the unique Platform edition. This is quite simply letting you create your own app maker. So clients can build the apps themselves while you manage subscriptions, features and analytics in your dashboard. You can host it yourself for a one-off fee of €799, or pay €149 monthly. Extra costs: Loads of them really. Since their initial offer is so cheap, Siberian make their money back by selling modules and services. These range from installation of the platform on your domain for you (299€) to extra features like surveys (89€ for a 1 year license or TaxiRide for a Uber clone (159€ for 1 year license). Also: you can't host these versions of Siberian on shared hosting plans, so you need a VPS or dedicated server. They can be pricier than standard hosting plans. Reseller tools: The best one is probably the integrated payment solution so you can integrate gateways. This means creating your own subscription models for clients and you can even manage invoices and subscriptions. There doesn't seem to be any help with marketing. Unique approach: This would be the fact that the apps are completely open source. In short, you have complete control over the source code, which is super handy if you work with a developer. 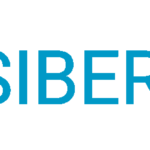 Become a Siberian CMS reseller now. Price: Their reseller plan costs $250 a month (billed yearly). This includes 10 app credits. You need to pay a hefty $399 per iOS submission. After your first 10 apps, you can purchase extra ones at a discount. Main features: Food ordering, push notifications, loyalty programs, mobile shopping cart, bookings. Reseller tools: You get a dedicated Partner Success Manager, sales training, marketing materials, video tutorials, webinars and access to their Reseller Community. Plus access to a very handy lead-generation tool called Bizness Health where you can find new leads and monitor the state of your business. Unique approach: BiznessApps are probably the most marketing focused of all app makers, offering tons of resources to really help you find leads and sell your apps. 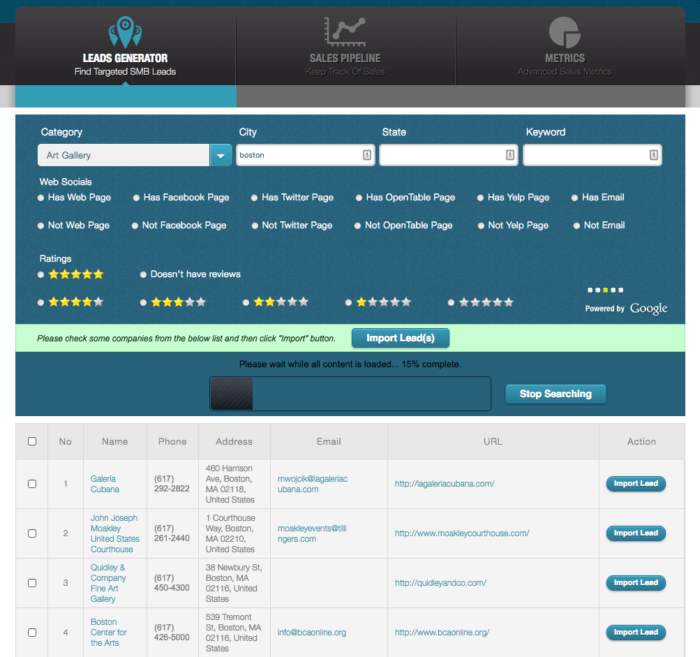 One of BiznessApp’s advanced marketing tools – a very effective lead generator. Price: AppInstitute's reseller plan costs $340 per month. It gives you 5 native apps for iOS and Android as well as PWAs. Main features: Loyalty features, in-app store, directory, booking and more. Reseller tools: 90 success plan (training) and marketing material for all plans. Free app resubmissions and free sales website for Gold and Platinum. 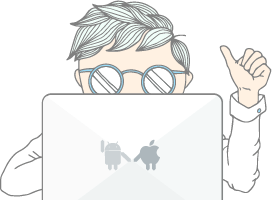 The Platinum plan also comes with extras like free logo creation, domain registration, Google Developer License and 1st year Apple Developer License amongst others. Unique approach: Nothing special there either. Price: 5 apps for 100 € / month. 10 apps for 150 € / month or 1500 € / year. Extra costs: Nothing to note. Main features: Booking, table reservation, coupons, stamp card and more. Reseller tools: Reseller dashboard, customer CMS. Unique approach: AppYourself lets you create your own plans so you can give your clients different pricing options depending on the features they need. Price: The “Agency” pricing, as Shoutem calls it, starts at $279 / month. It doesn’t limit the amount of apps you can build, but instead lets you buy $310 worth of standard Shoutem app subscriptions. While it looks rather confusing, there are two advantages to this method: one is that you can create apps with the lite, basic or advances plans (different prices and different levels of features). Two, you get a discounted rate based on the number of apps you build. Main features: A small but decent list at the moment: coupons, community features, events and places. Reseller tools: Shoutem offers personal training to help you get started with the platform. You also have a dedicated account manager, and will be able to access white label promotional material to sell your apps to clients. The new Shoutem extension marketplace. Not quite complete at the time of writing, but a good example of how well-designed their platform is. Unique approach: Shoutem is taking a leaf from WordPress’s book by opening its code to developers. They aim to create a big marketplace of extensions that you can tweak and integrate with your app. If you know how to code or work with a developer, this could be a huge plus. Certain features use third party solutions. These usually start free but could become expensive if you rely on them a lot. Main features: In-app store, loyalty features, geo-localization and more. Reseller tools: Nothing special here. Unique approach: AppyPie offers lifetime subscriptions (which actually only remain active for 5 years). It’s essentially a discounted rate when you pay a big lump sum in advance. Price: Their only option is the reseller pack which costs $39 / month. You can publish 10 apps with it, with unlimited users and updates. Main features: Pretty basic e-commerce and location-based services. Unique approach: AppMakr is one of the rare app makers to gives you the source code of your white label apps. Also: dead cheap. In conclusion, it is worth reiterating that, as a reseller, you will become the app makers’ privileged user. You should therefore expect a certain level of support and service to create the apps as easily as possible and focus on selling them instead. The other good news is that you can easily test the waters by choosing the best app maker for one app and trying to sell it. If you are successful, you can then start thinking more seriously about setting up a stable business. And if you really want to grow it, there is no reason why you couldn’t invest in more than one app maker reseller package! Did we miss anything? Considering another white label option? Let us know in the comments below as we’ll be exploring reseller programs more in depth in the future with complete comparisons and video reviews.